Lisa of The Blozulfog – (pictured far right) Lisa is a spicy red-headed mother of 2 from Indigranola. She pretty much runs West Sound Academy with her administrative skillz. She has been writing at The Blozulfog since February 2008. She says she enjoys bird watching and fly fishing, but by that she really means dancing, laughing and being awesome. 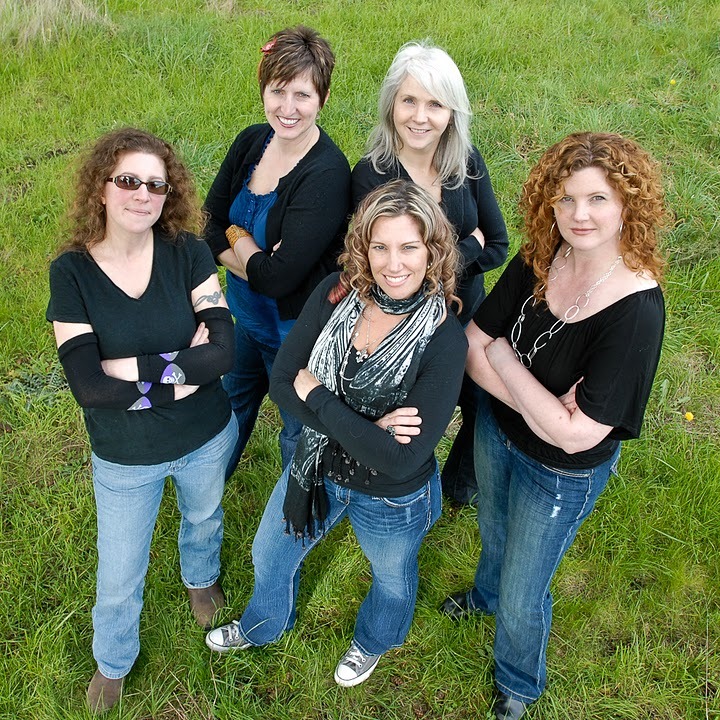 Michelle of Falafel and The Bee – (pictured far left) Michelle is a creative mother of 2 from Hansville. She can sew (amazing) and makes the most fabulous children’s hats and clothing. She is a down to earth girl who is conquering the world of gluten-freeness and all natural goodness. She has been blogging at Noggin Toppers (now Falafel and The Bee) since October 2008 and enjoys sewing, crafting, creating, chocolate, foot rubs, and of course, being a Mom… and also being awesome. Stacey of Oh Happy Days – (pictured to right of Michelle) Stacey is a dynamic and HILARIOUS mother of 2 from Poulsbo. She is a go-getter kinda gal and can get a project going like nobody’s bidness. You need something done? Stacey is the gal… but she’s pretty busy, just so you know. Stacey has been blogging at Oh Happy Days since October 2008 and enjoys rippling abs her family, traveling, celebrity gossip, a good sense of humor, and being awesome. Wendy of Let the Dog In – (pictured to left of Lisa)Wendy is a zany former Texas-girl mother of 1 from Bainbridge Island. *Yeehaw! * I hear she makes quite the pot of chili, but have yet had the chance to take on that claim. Wendy is a delight with a spunky wit and has a great way of taking the normal traumas of life and making them fun. And she’s smart, and has a smile that lights up a room. Wendy started writing at Let The Dog In! in November 2006 and later at the (now-defunct) Seattle P.I., at her reader blog, Bainbridge Breezes. Wendy enjoys walking with her dog, drinking her 523 kinds of tea, taking improv classes, and watching finches and nuthatches pig out on her feeders, pretty much in that order. I am Jenny of Jenny on the Spot (center). I am a mother of 3 from Poulsbo. I try to be funny so as to distract from awkward social moments, and think I am pretty great. I have been blogging at Jenny on the Spot since April 2004 and am confused as to why I am not yet globally famous. I enjoy coffee, glitter, chocolate, comedy, the interwebz and being awesome.